In a lot of ways I simply inherited my euroscepticism in the same way that northerners have family traditions of voting Labour even if the candidate is a hatstand. It was never obsessive for me until about 2008 when various strands came together. This was around the time of the banking crisis and at the height of my foaming libertarianism. By this time the then Labour government was in its final leg, more unpopular than ever and embattled. This was when energy prices were at the centre of a major political row, and I remember a pivotal Radio 4 interview where a junior minister came on to exalt the virtues of switching suppliers. Telling someone on a token meter that they can simply switch suppliers to end the rip off is pretty much "let them eat cake" territory. If there is one overriding quality to the Blair-Brown regime it was arrogance. They considered themselves untouchable and able to do as they pleased. For the entire time Labour was in office my vote was utterly meaningless. Our democracy is only a democracy to the extent that we can elect our dictators to sit for a term of around ten years. Between the milestone elections they can ram through pretty much any legislation they like without fear. What we needed at the time was a major renewal of our energy infrastructure but primarily it needed to focus on affordable energy, not least since we were staring down the barrel of a major economic contraction. You would think that a Labour government, supposedly the servant of the working class and the destitute would have prioritised cheap energy. But no. 2008 was the height of climate narcissism. They would toddle off to their world stage jamborees to compete with other global elites to see who can impose the most draconian limitations on growth be it through energy targets or green taxes. Government by virtue signalling. This brought about the Energy Act 2008. One of the largest spending programmes in recent history. As with all government spending programmes this was less to do with achieving the actual objective as creating makework jobs and meeting globally mandated targets set down in treaties. There was also a major EU dimension. It contained everything from creating a single European energy market through to carbon capture storage and smart meters. Though such may have appeared in a Labour manifesto, the agenda is not one that is legitimately derived from its membership, rather it is all part of the grand designs of the European Union, implementing Paris accords and UNECE frameworks. If you go back to the beginning of the referendum campaign, there was a debate about how much of our law is really made by the EU. It was a futile debate in that a percentage tells you nothing about the scale and gravity of the rules that make it on to our statue book. But one of the distoriting factors is that so many of our laws presenting as domestic initiatives are laws implementing directives, frameworks and targets which have a profound effect on national and local government and policy outcomes in respect of utilities and transport. This is what we call the "hidden Europe" phenomenon where EU incursions are reported as domestic politics which is why there is such colossal ignorance as to the full extent of EU integration. When you understand that dynamic you start to realise that government is something that is simply done to you rather than having any meaningful democratic impetus. By 2008, the Tory party was then gearing itself up for their crack of the whip being that Gordon Brown was the PM that nobody wanted. His tenure was an inheritance. Being that the Tories had to shake off their stodgy image in order to get anything close to fair media coverage, David Cameron went on bunny hugger, essentially telling us that if we voted Tory then we were in for much of the same. This did not go unnoticed by actual conservatives who buggered off and voted for Ukip. Which is why he ended up in a coalition with Nick Clegg. This proved one thing. General elections were little more than an electorally mandated reshuffle where we can change the faces but the agenda remains the same, and for as long as we were in the EU then we could expect more of the same vanity spending and legislation geared an implementing ever closer union. It is interesting that Brexit should be blamed on austerity when in fact it was Britain's high tax, high spending that really piled the pressure on household budgets. The genius of it all though was that state mandated spending was paid for through stealth taxes through our bills which allowed politicians to blame the energy companies for skyrocketing bills. To put this in context this was right about the time when Labour had just opened the doors to eastern Europe, vastly underestimated the numbers that would come, and having ratified Lisbon without a referendum, while amalgamating local government to become part of the vast quangocracy geared toward implementing edicts from Whitehall and Brussels. We received the message loud and clear; that government could do as it pleases to us and did not feel the need to consult us, and we would never be allowed a meaningful say in anything it does. And they liked it that way. Fast forward to 2019 and the mentality is much the same. Having been used to decades of marginalising the voice of voters, using our money to spend on their boondoggles and flights of fancy, they are having trouble coming to terms with the idea that they have to take the wishes of the public into account. Brexit more than anything interrupts the habits of government. Democracy is the disruptive element and they really don't like it. They consider it a distraction that gets in the way of their business. More than anything Brexit has revealed the snobbery of the establishment in that it challenges what they believe to be their divine right to rule. Right now MPs are conspiring to prevent Brexit by any means necessary even if that means nullifying the first meaningful vote we've had in decades. They want things to go back to normal - back to doing as they please and ignoring the oiks with their primitive ideas about sovereignty and democracy. We have been told by remainers that parliament never lost its sovereignty. To a large extent they are right. Parliament used its sovereignty in the service of the EU agenda ad decided to serve the Brussels machine rather than the people. Who cares if they can't afford to heat their houses? The problem here is that the people themselves are not sovereign. Under EU rule, with the collaboration of our quisling parliament, we are just economic units and the only objective of governance is GDP growth. Culture, tradition, identity, community and family are alien concepts and where labour is concerned, actively harmful. We must instead learn state dependency under a monoculture. Though we did eventually chuck Labour our, what we got was a continuance of the progressive liberal regime, and though it was led by Tories who made some rationalisations to the state, what is common described as austerity is little more than accountancy. The left have capitalised on it to promote the evil heartless Tories narrative but essentially the approach to government is much the same and it will continue to work in the service of the neoliberal EU. As much as the Tory Brexiter "free trade" agenda is wholly unconvincing, trade and free markets was never the rationale for leaving the EU. Primarily this is a question of who our government really serves and who it is accountable to. As Brexit fatigue creeps in, there are days where I wonder if any of this is really worth the bother, but then I cast my mind back to the televised leaders' debates. I keep coming back to that because it was another one of those totemic moments revealing the politico-media establishment in all its trivialised out of touch glory. If we let them get away with stopping Brexit we know exactly what will happen. Within six months they will have bruised it under the carpet, and we may get one or two tinkering reforms such as a valueless people's assembly (a super-focus group) and a few more directly elected mayors, as though such could ever mollify a public who are so utterly sick of them all. 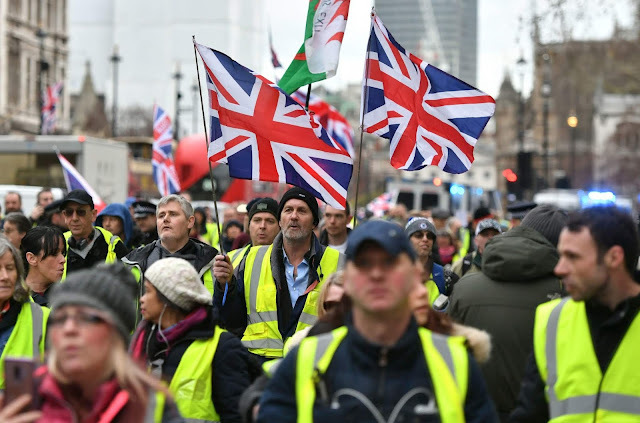 Progressive liberals complain that Brexit has unleashed a tidal wave of intolerance, but what is has really done is brought back real politics to the fore - the kind of politics their regime has managed for so long to keep a lid on. Now that's happened, they desperately want it to go away. Brexit, more than any one single factor, is the fight for the sovereignty of the people over their rulers. It is part of the centuries old struggle to make servants of our masters. For too long British votes have been treated with contempt. Our wishes have been swept aside in pursuit of the grand delusions of our narcissistic elites. They raid our wallets with impunity to impose their authoritarian designs upon us; to build a global order primarily for the convenience of capital. Our voices do not matter a damn. They will smear us, slander us, call us far right, and use any tactic to marginalise our voices. They have long believed the running of the country is none of our business. Should they succeed in killing Brexit, they succeed in killing politics entirely. The corporate takeover of Britain will be complete and our figleaf politics will become even more of a meaningless appendage than it already is. Voters often wonder why we have the worst crop of politicians in living memory. It is no mystery. When a public get used to the idea that their voices don't matter, the process of electing representatives is as meaningless as tossing a coin into a wishing well. Were that we had politics of substance we might very well pay more attention to who we elect. Until we do, we can only descend further into mediocrity and democratic oblivion.